Why Sasha Became a Hypnotherapist - Hypnosis in L.A. Why Sasha Became a Hypnotherapist - Hypnosis in L.A.
“Sometimes it’s like being freed from a curse,” says hypnotherapist Sasha Carrion about the benefits of the treatment. Hypnosis can be an effective treatment for mild depression and anxiety disorders. Sasha Carrion will tell you from firsthand experience: It takes a lot of strength to overcome a lifetime of trauma. But nearly 30 years after her mother disappeared — murdered, she believes, by her own father — the 32-year-old former Torrance resident has figured out a way to put the past behind her. Hypnosis, a process by which a person enters a state of deep relaxation and heightened suggestibility, helped Carrion heal by allowing her to let go of her past. It wasn’t an easy past to relinquish. Carrion’s life has been a series of struggles — tragic events that began 27 years ago when she awoke one day to find her mother, Rosa Maria Marquez, missing from their Bell Gardens home. Her father fled to Mexico shortly afterward, leaving Carrion and her 3-year-old sister in the care of their widowed grandmother. Because her mother’s body was never found, police never categorized her disappearance as a murder. Consequently, Carrion wrestled with the possibility that perhaps her mother had left them. For almost a decade, she maintained a relationship with her father and his new family. She sent gifts. She visited often. Then one day, her uncle came to her with a confession. Carrion tried to get legal action taken against her father — she even got her story featured on the Web site of “America’s Most Wanted.” But there was no evidence. No body. Nothing she could do. In 2007, her father died from a rare form of lymphoma and cirrhosis of the liver. Carrion said she didn’t mourn. 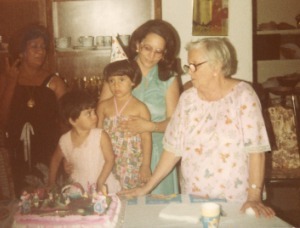 Sasha Carrion wearing the party hat celebrating her last birthday with her mother, sister and the grandmother that raised the two girls. By that time, years of distress had taken its toll. Not yet 30, Carrion was suffering from a host of ailments, migraines, hair loss, stomach pains and backaches. Doctors couldn’t help her, she said. Antidepressants didn’t work either. Carrion said becoming a hypnotherapist herself (at the time she had been working in the fashion industry) was a natural step. Within months, she was certified by the International Hypnosis Federation and the Omni Hypnosis Training Center, the first accredited school of hypnosis. She had found her calling. For most people, hypnosis conjures images of swinging pendulums and sleeplike trances. In reality, it is more aptly described as a state of focused attention and heightened suggestibility, during which the patient is completely aware of what he is doing and saying. Hypnotherapy is often used to help people stop smoking, lose weight and overcome phobias. It also has proven helpful, as in Carrion’s case, in overcoming trauma. To break the trauma cycle, a hypnotherapist must replace negative thoughts with positive, reassuring thoughts and feelings. “Sometimes it’s like being freed from a curse,” Carrion said.